Thank you again for the WONDERFUL performance Saturday! It was a perfect afternoon of outstanding music and the band and vocalists did a superb job.The program was just a perfect combination and flow, too. It really kept the audience engaged and entertained. I'm sorry I didn't get to talk to you again Saturday before you left to tell you. Thanks again for all your help in putting this together, too. Everything went so smoothly with Linda and the grant. Hopefully I'll get to another SOS concert or two this summer. Several months ago, when the Alliance Community Concert Association announced its 2001-2002 season, there was not thought that the opening of the season might take on the significance it did Sunday afternoon at Alliance High School. The concert, featuring Marcus Neiman & The Sounds of Sousa Band, already had its patriotic elements; according to the printed program. How could it be otherwise? Sousa was a patriot whose many marches are firmly ingrained in the American experience. But essentially it was planned as a typical program of the kind which Sousa and his world-famous ensemble offered in the years they were making musical history — a mélange of light classics, opera selections, virtuostic solos, and even Dixieland, in addition to the standard marches. That was before the events of Sept. 11, 2001. And before the coordinated military response to those events which unfolded Sunday afternoon. Attired in a period band uniform as Sousa, Neiman announced at the start of the concert that “America is at war with Afghanistan,” and changes in the program had been made. It was only the first of several such moments during the nearly two-and-a-half-hour concert that had the capacity audience on its feet more than once. It happened in the second part of the program when Kay Raplenovich, serving as narrator and vocal soloist, introduced a song composed by a Russian immigrant named Israel Baline. When the strains of Irving Berlin's “God Bless America” sounded, the audience rose to the occasion. It didn't matter that the song, written during World War I, was not issued by the composer until 1938, six years after Sousa's death. It was the kind of lyric expression that the famed conductor would have taken to heart. Another emotional moment was provided by the planned “Armed Forces Salute.” As the official song of each of America's services — Army, Coast Guard, Marine, Air Force, and Navy — was played. Raplenovich invited persons who had served in those branches to stand and be applauded. The Sounds of Sousa Band, founded by the Medina-based Neiman in 1992, is made up of brass, woodwind and percussion players from around Ohio. The variety of selections showed off a high degree of musicianship, in both ensembles and solos. That was evident from the start in the colorful and energetic overture to “Il Guarany” by the Brazilian composer Antonio Gomez, a Sousa favorite, and in one of several encores throughout the afternoon, the “El Capitan” march, derived from Sousa's most successful operetta score. The latter was the first indication that band music need not be played at the same decibel level throughout. The precise softer sounds of Neiman's ensemble were superbly rendered without sacrificing tempo or energy. The cornet soloist is almost a cliché in American band music. Erik Svoboda made it much more than that with his dulcet tones progressing to brilliant triple tongue passages for “Grand Russian Fantasy,” which included a portion of another country's national anthem. Passing through a medley of traditional American tunes, including “Yankee Doodle,” the band showed off more of its individual talents in the cornet trio of Leroy Anderson's “Bugler's Holiday,” another “out-of-his-time” item that Sousa would have snatched up. On the mark were Svoboda, Marcia Nelson-Kline, and Christopher Burdick. John Olsson's euphonium solo of the old standard “Carnival of Venice,” was another big crowd pleaser. The second half, launched with a selection of cheery Gilbert and Sullivan tunes, included and equally lively “Dixieland” segment spotlighting a quartet of marching soloists. But two pieces, in addition to “God Bless America,” reminded the audience of exploding world events — Raplenovich's heartfelt rendition of “Danny Boy,” proceeded by a memory of visiting the coast of Normandy, and her equally inspired narration of a somewhat abridged “Lincoln Portrait” by Aaron Copland. Selections from the speeches of The Great Emancipator that accompany Copland's music showed that America is a country that stands on solid ground in relation to its heritage. It sent the audience into the sunshine of the autumn afternoon with a sense of renewal and purpose in the face of gathering events. Marcus Neiman leads a double life. Every week he can be found leading rehearsals for the Medina Community Band. The popular ensemble includes a mix of amateur and professional musicians who perform concerts on Fridays in June and July in the gazebo of Medina's uptown park. Marcus Neiman of Medina impersonates the great American composer John Philip Sousa. His Sounds of Sousa Band has become an attraction throughout northeastern Ohio. More and more, you'll find Neiman looking notably different. 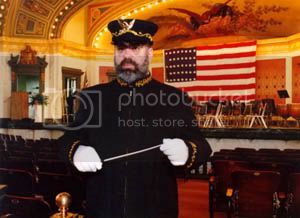 That's when he puts on a uniform and takes on the character of another director to lead concerts in the style of John Philip Sousa. Neiman's Sousa persona came to life in 1986 when Paul Droste, marching band director at Ohio State University, encouraged Neiman to take the stage at one of his community band concerts. Directors across the country were asking people to sign petitions to make "Stars and Stripes Forever" the official national march. Neiman didn't simply stand up and ask, he donned a homemade costume and featured Sousa's music at the concert. People enthusiastically signed the petitions and told him they loved his portrayal. "I had a ball," he says, "and many people encouraged me to continue. At first, the only thing I knew about Sousa was that he wrote a lot of marches. I've done a lot of research to learn more about him and how he might have programmed a concert if he were alive today." For instance, Neiman has received copies of original arrangements from the Sousa Archive Library at the University of Illinois, enabling him to duplicate the sound. "It's his music in his writing. The librarian allows me to have copies because I use them for historical purposes. It has given me a much greater understanding of the man and his music." Neiman has also talked with former Sousa band members and is often approached by elderly people who fondly, and tearfully, remember being children taken to hear a Sousa performance. In 1992, the centennial of the date Sousa formed his first nonmilitary band, Neiman decided he would start his own professional band. "I talked to three or four musicians while I was directing a concert in Bay Village and told them I'd like to start a little band to perform in the style of John Philip Sousa," he recalls. The instrumentalists, like Neiman, are members of the American Federation of Musicians. Now, he has a pool of 50 professional musicians in northeastern Ohio. He also has a similar group in the Cincinnati area, where many of the concerts are performed. The size of the band depends on the size of the venue. That's the protocol Sousa used. "I don't impersonate Sousa," Neiman says, "I try to do a characterization using some of his mannerisms, his philosophy and his style of programming and conducting." Of course, he has several professionally fashioned uniforms made precisely like those Sousa would have worn. And, when he takes the stand, one can imagine the famed leader stepping up with baton in hand to start the music. Neiman is increasingly in demand around the country in his role. He takes to the road to lead bands of all kinds, including those of high schools, colleges and community groups. Droste has been impressed with Neiman's work. "Marcus is a natural actor and conductor, so his portrayal of John Philip Sousa comes off as audience-friendly and informative," Droste says. "Some of us still feel that the Sousa Band of the early 20th century was responsible for many of the fine high school, college, and professional bands that followed. Marcus is keeping this fine tradition alive." Neiman, who grew up in the Akron area, earned his bachelor of science degree in music education from the University of Akron and his master of music education degree from the University of Michigan. He started his career in Medina as a high school band director and has been fine arts consultant for the Medina County Educational Service Center since 1980. He will retire in December but plans to continue helping local schools with grant writing and implementing fine arts tours he initiated for Medina County schools. He completes his second year as president of the Ohio Music Educators Association in July. He is a founder, past president and member of the Medina County Arts Council, and a founding trustee and secretary of the Medina County Performing Arts Foundation. Neiman was a panelist and consultant for the Ohio Arts Council and is a fee-support artist on the arts council's presenter-touring roster. He is a past executive board member of the Ohio Arts Presenters Network and Ohio Alliance for Arts Education. He enjoys educating people about Sousa, but Sousa himself was a pure entertainer. "He didn't play music he felt should be played, he played what the audience wanted to hear," Neiman says. "However, he was among the first to bring Western European and American music to the stage. He probably did more for the advancement of modern music than any symphonic conductor." Neiman follows that lead by including music that hadn't been written in Sousa's time, "but that he might include in one of his concerts now." Sousa also had structured section leaders who were expected to teach the less experienced members what it was like to play in the famed band and how to survive the grueling tours. "If you are a brass player, the kind of schedule they kept — two or three concerts a day — could destroy your lips," Neiman says. "Section leaders would show the younger men how to keep going without the pain and the expectations. For instance, they would put their uniforms under their mattresses at night to press them." Upcoming concerts of the Sounds of Sousa Band are at 7 p.m. Saturday at Lakeside's Hoover Auditorium; 7 p.m. Monday at the Brunswick Recreation Center; 8:30 p.m. Tuesday with the Medina Community Band on Medina's Public Square; and 6:30 p.m. Sept. 3 on Hudson Square.